If you’ve been following this blog, you’ll know that I’m a big fan of PaaS providers – heck, I even built one which gave me even greater respect for all the work that goes into making a platform that is flexible, scalable, reliable and easy to use. During the last few weeks I’ve been kicking the tires on these PaaS solutions, both publicly hosted ones like Heroku and Dotcloud as well as open source ones like OpenShift and CloudFoundry. 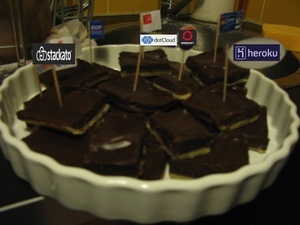 Last night I gave a talk Django deployment revisited at the Django Boston meetup group, and discussed four different PaaS providers: Stackato, Dotcloud, OpenShift and Heroku. As an example, I showed for each provider how to deploy Mezzanine, a Django-based blogging and CMS software. All the code used in the examples is available in this paasbakeoff Github repo – with a different branch for each PaaS provider. All of the providers will provision a PostgreSQL or MySQL (except for Heroku) database for you without you needing to do anything except issue one command. The actual database creation happens automatically except for Dotcloud in which you get to specify the name of the database in your settings.py, and you have complete control about how it’s created in a createdb.py script. You can either see this as an advantage (complete flexibility) or a disadvantage (one more thing to have to manage). It’s the classic tradeoff – control. vs ease-of-use, that is a recurring theme when adopting a PaaS solution. You can also use VCAP_SERVICES to retain CloudFoundry Core compatibility. Also see the convenient dj-database-url package by Kenneth Reitz for handling the parsing of the DATABASE_URL string with one line of code. Heroku lets you attach multiple PostgreSQL databases (master/slave, or staging/production) and each database gets it’s own color-coded database URL (i.e. HEROKU_POSTGRESQL_GREEN, HEROKU_POSTGRESQL_RED, etc.) Most Django projects are only going to use 1 database, so Heroku provides a pg:promote command that lets you promote that database to be the canonical DATABASE_URL. Similar to the STATIC_ROOT, the files in MEDIA_ROOT need to not only be served up Apache, Nginx or uWSGI, but also need to be persisted across subsequent deploys. By default, files that are uploaded through your Django application will be stored in the application container that is thrown away on every deploy. So we need to tell Django to store these files in a data directory that won’t be discarded. You then need to symlink this directory to the static directory that is being served up by Apache (see above in STATIC_ROOT). The PaaS providers use mod_wsgi, uWSGI or Gunicorn to serve the Django application. Stackato uses uWSGI by default but you can use gunicorn instead if you prefer. You simply place a wsgi.py file that references our Django settings file. OpenShift uses mod_wsgi and expects to find a file /wsgi/application that looks something like this. Like Stackato, Dotcloud expects a wsgi.py file in the root of the project directory. All of the providers expect a requirements.txt file to be in the root of the project directory except for OpenShift which uses the more Pythonic way of defining dependencies in a setup.py file. You can still reference your requirements.txt file using this trick. OpenShift doesn’t seem to have a configuration file, so you have to add the cartridges (database) with a separate command. Heroku uses a Procfile but most of the configuration is done using the config and addons commands. When it comes time to provide instructions for what should be done when you do a deploy, each provider has a slightly different way of handling these management commands (syncdb, collectstatic, migrate, etc.). Stackato uses post-staging hooks in the stackato.yml file. Dotcloud uses a simple postinstall bash script. OpenShift uses a deploy bash script in the .openshift/action_hooks directory. Heroku does most of these things for you automatically and you can disable them by adding a collectstatic_disabled marker to the .heroku directory. Many advanced Django applications require the use of background job processing using Celery, a distributed task queue. Which PaaS providers support Celery? Stackato supposedly had Celery support at one time as evidenced by this thread, but the latest commit on the celery-demo app is that it no longer works. OpenShift supposedly has Celery support according to this thread and this closed bug, but I don’t see any definitive documentation about how to set it up on OpenShift. Dotcloud has a complete documentation page on how to use Django and Celery on Dotcloud. Heroku lets you run Celery as just another worker. So who took the 1st prize trophy home? This is by no means an exhaustive list, but just the things I could think of off the top of my head. If you have suggestions for other things to be included, let me know in the comments below. There were a lot of questions at the end about reliability, portability, extensibility which I think sums up the reasons that people are still not jumping on these PaaS platforms. When you’ve got something that works (Fabric file that pushes to AWS), why change it? Several people contacted me afterwards and said that after my talk, they are now reconsidering their opinion of PaaS providers and might dump the Linode, Rackspace, AWS servers that they’re babysitting in favor of a PaaS deployment solution. PaaS is still in its infancy and it will be interesting to see over the next few years what happens in the developer ecosystem as these platforms mature. There will no doubt be more consolidation, and hopefully some standardization around common formats. Imagine being able to define a generic deploy.yml file in your code repo that is consumed by each PaaS provider and translated into their specific way of doing things. At the last DjangoCon 2012 sprint, we started working on a project called django-deployer, to attempt to make a PaaS-agnostic deployment tool for Django. We added support for Stackato and Dotcloud and then the sprint was over, and I haven’t had time to revisit it. But if anyone is interested in working on this, let me know! I only had time in this presentation to cover four PaaS providers, but there are others that have Python/Django support including Amazon Elastic Beanstalk, Google App Engine, CloudFoundry, AppFog and even Microsoft Azure! What would you like the next blog post to be? Leave a comment below to express your preference! Sign up for the SaaS Developers Kit to get notified about useful developer tips! 1. Additional Paas Providers and the comparisons with each other, If all facts are presented about the PaaS providers it can be easier for developers to decide which tool the really want to go for.